Reconstructed facsimile of an advertisement that appeared in Lowell's Business & Professional Directory of Eastern Townships. 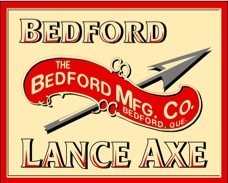 Facsimile of a label that appeared on a double-bit axe. The Bedford Manufacturing Co. was established in 1895 by a number of businessmen who had dealings in Bedford, Quebec. A 1901 letterhead lists the principals and directors of the company as S. L. Clayes (President), George S. Walsh (Vice President), Edward Coslett, O. S. Rixford, George A. Coslett, F. C. Sanders, A. J. Bouchard, S. Coslett and J. J. Mullin. George A. Coslett was also the Secretary and General Manager. The company engaged in the manufacture of hand held farming and agricultural tools including axes, scythes, hoes, forks and rakes. 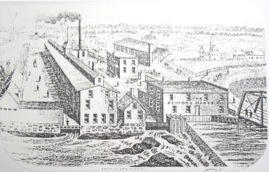 Prior to becoming the Bedford Manufacturing Co. the business had operated as the Rixford Mfg. Co. at 74 River Street in Upper Bedford, the same address as that listed for the Bedford Mfg. Co. That location, or very close by, had housed scythe and axe making concerns since 1840. The original scythe and axe maker had been Zeno(n) Faber who had relocated from somewhere in Massachusetts. Over the years the business changed hands a few times and axes were not always part of the goods made. It should be noted that O. S. Rixford was the principal owner of the Rixford Mfg. Co. of East Highgate, Vermont. O. S. Rixford is noted as having started to manufacture axes in Bedford, Quebec in 1874, six years prior to him commencing to make axes in East Highgate. The East Highgate location, like the Upper Bedford location, was initially devoted to the making of scythes. The specifics of Rixford's association with George Coslett and the Bedford Mfg. Co. are not clear but it appears that Edward Coslett (George's relative?) was in some way associated with O. S. Rixford in other business ventures. George, believed to be Edward's son, was a superintendent for the Rixford Mfg. Co. at one time which helps to explain why he became the general manager of the Bedford Mfg. Co. when Rixford relocated their Canadian operations to St. Paul in 1895. Originally the works were located along the south bank of the Pike River in what was called Upper Bedford but due to calamities over the years (fires and floods) the business eventually relocated in Bedford proper at a spot believed to have been near the original works and also on the south bank. The location adjacent to a waterway was critical as the works originally relied on water power to operate the heavy equipment. When the Bedford Mfg. Co. got up and running, the forging was done in a large shop that apparently had been converted from a structure previously used as a brewery. Earlier, a gristmill was also located on the north side of the river and that had been converted into a sawmill. O. S. Rixford converted part of that mill into a handle factory while maintaining another part as a sawmill. Rixford is said to have turned the sawmill over to others in 1892. Sometime later on the Bedford Mfg. Co. reestablished the handle making facility for their own use. In December of 1913 the entire Bedford Mfg. Co. forging works was lost in a fire. Rather than completely relocate or dissolve the business, the company made an agreement with the Bedford Town Council wherein the company rebuilt the axe shop with a degree of financial help from the Town Board. This was an understandable agreement considering the town was actually a share holder in the business and the works employed a significant number of hands, all local to Bedford. After that the Town made water privileges available. The Bedford Mfg. Co. then purchased the property that had previously been the location of the power generation plant, along with some additional land, and then proceeded to enlarge the works. Sometime in 1930 the company, along with the actual real estate, was sold to the Canada Axe & Harvest Tool Mfg. Co., a subsidiary of the Welland Vale Mfg. Co., a well known axe and edge tool manufacturer. The Welland Vale Mfg. Co. itself was sold to the American Fork & Hoe Co. later in the same year (1930) but the Bedford plant continued to operate until 1933. Quite possibly the American Fork and Hoe Co., operating under the name True Temper, took some time in restructuring their newly acquired Canadian subsidiaries. Whatever the case, sometime prior to 1933 some of the equipment was relocated, the buildings were sold and the main building was then converted to accommodate a different type of industry. Facsimile of a simple label used on some Bedford Mfg. Co. axes. 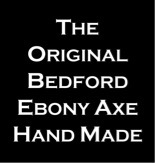 This company will be included in the CANADIAN AXE MAKERS booklet. We do not provide value evaluations. Facsimile of a letterhead for the Bedford Manufacturing Company located at 20 "du Pont" Street around 1901. Special thanks to Gerald Schultz of Kanata, Ontario, for providing the initiative for me to research this company and merci beaucoup to Heather A. Darch, Conservatrice/Curator of the Musée Missisquoi Museum, Stanbridge, East Quebec for sharing her expertise and the museum's resources. Cross reference articles published on the YesteryearsTools web site that relate to this article; The Rixford Mfg. Co. and Hinds Co.